In this method of earthing, natural is directly connected to earth by a metallic connection or a wire of negligible resistance and reactance. The charging currents flows through the system under normal condition similar to ungrounded system. Because of the connection of system neutral point to earth, it always remains at earth potential at all operating conditions and under faulty conditions voltage of healthy phase will not exceed. The solid grounding us represented in the Fig. 1. Whenever there is earth fault on any one phase (phase B in this case), the phase to earth voltage of faulty phase is zero while voltage to earth of the remaining two healthy phases will be normal phase voltages as neutral in this case is not shifted. 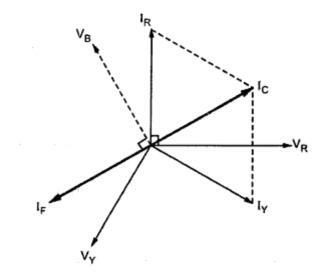 The phasor diagram corresponding to this condition is shown in the Fig. 2. This current is mainly dependent on zero sequence impedance of the source of power and that of phase conductor upto fault point. As the resistive component of zero sequence impedance is normally negligible, the fault current which is large can be assumed as lagging the fault phase voltage by 90o. From the phasor diagram, it can be seen that If and IC are exactly opposite due to which capacitive current is neutralized by high fault current which eliminates the possibility of arcing grounds and overvoltages. The discriminative types of switchgears may be used in this method. i) Due to high value pf fault currents, the system may become unstable and there will be greater interference to neighbouring circuits. Thus this method is employed where system impedance is sufficiently large to limit fault current. ii) With high values of fault currents, circuit breakers are difficult to handle and heavy contacts are to be provided in the circuit breakers. The above disadvantages can be overcome by employing high rupturing capacity and high speed circuit breakers along with fast operating relays. This method is used in high voltage systems with voltages below 33 kV with total capacity not exceeding 5000 KVA for the economic reasons.